In 1972, Czech movie director Jan Svankmajer was part of a military experiment that subjected him to intravenous doses of LSD. One might think that this horrific ordeal, slowly and effectively pushing him over the brink of sanity, has much to do with the nightmarish imagery and themes that are the backbone of his first feature length film, Neco z Alenky (Alice), but that particular experience is really only a small piece of the puzzle. 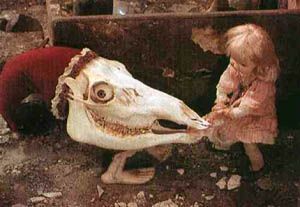 Perhaps a more component of the wildly unique films of Svankmajer is the fact that he is one of the leading Surrealists of the 20th century. A movement probably best characterized by the art it spawned from masters such as Man Ray, René Magritte, and Salvador Dali, the tenets were actually outlined point by point by in André Breton in his various Manifestos of Surrealism. One notable quote that highlights the underlying ideology comes from Breton himself in his Second Manifesto: “Everything leads us to believe that there is a certain state of mind from which life and death, the real and the imaginary, past and future, the communicable and the incommunicable, height and depth are no longer perceived as contradictory." While Surrealism as a movement is generally considered to have lasted only through the mid- 1940s, numerous artists continued to work within its philosophy for years to follow. A sub-movement emerged in Czechoslovakia, and evolved as a response to heavy-handed Communist rule. According to Frantisek Dryje in his essay “The Power of Imagination,” the prevailing notion behind the Czech dogma is anti-rationalism. "The force of imagination allows us the privilege of casting doubt on every intellectual and emotional convention, and asserts the supremacy of transformation as an existential situation, a state which, looked at with rational logic, is impossible and therefore irrational." Taking things a few steps further, Karel Teige, a poet who is recognized as one of the leaders of the Czech movement, wrote specifically about the use of film for imparting ideas in his “Second Manifesto of Poetism,” techniques that had been followed by the influential early filmmaker Viteslav Nezval. "We have defined film as a dynamic picture-poem, a living play without plot or literature, a rhythm of black and white, and from time to time a rhythm of colour, a sort of mechanical ballet of forms and lights." So it is that Jan Svankmajer developed his own movie-making personality, creating in the long run numerous short and feature-length films that have brought him a number of devoted followers. After creating a series of (mostly) stop-motion animated shorts with a strongly perceived political bent, the fascist Czech government banned him from making any additional movies unless they were based on specific literary works. He followed up with adaptations of Lewis Carroll’s Jabberwocky and Edgar Allen Poe’s The Pit and the Pendulum before completing his first full-length feature re-imagining of Carroll’s Alice’s Adventures in Wonderland. This fantastic and nightmarish mind trip draws heavily from the very spirit of the book (Carroll could actually be considered a precursor to the Surrealists) as well as incorporating Svankmajer’s own experiences, paranoia, and singular beliefs. Alice combines live action with stop-motion animation to impart its story and themes. Released in 1987, the animated objects are by no means technologically advanced, nor are they pretty. And that’s completely intentional. To begin with, the film has a dreamy, illusory quality. There are portions of Alice where time seems to completely stand still...and stand still...and stand still. Where in other adaptations of the book the action moves quite quickly from the White Rabbit’s entrance to the actual events in Wonderland, in Alice our protagonist wanders through mazes and labyrinths of dresser drawers, household items such as scissors and safety pins, and more obtuse objects like protractors and compasses. The chase has a conspicuously endless feel to it, which not coincidentally, makes it feel exactly like a nightmare from which one simply cannot wake. The insanity literally continues once Alice encounters the tea party, a repetitive-to-the-point-of-absurdity affair that is jarring in its emphasis of the unreal. The characters that populate the film are grotesqueries, culled mostly from everyday objects that are rendered simply unnatural. The White Rabbit is a taxidermist-created atrocity; to make his escape he pulls up his feet from the nails that confine him, spilling sawdust with every step he takes. Not yet alive and not quite dead, he’s a Frankenstein’s monster with a determined and driving focus to make his appointment on time. Even more monstrous are the variegated tiny little creatures that attack Alice as they come to the White Rabbit’s aid. Almost all of them have skeletons for some portion of their body, constantly bringing attention to the fact that they live yet don’t precisely belong in the world of the extant. Meanwhile, the Mad Hatter and March Hare are neglected and fraying childhood toys, while the Queen’s court is composed of actual playing cards. Possibly the greatest oddity is the roomful of socks that burrows into holes in the floor. One of these finds some eyes and some teeth to become a monstrous imitation of a caterpillar. After it speaks to Alice, it demands to be left alone so that it can go to sleep, darning its own eyes shut with a sampling of sewing thread. Similarly, Alice isn’t always perfectly human. When she shrinks, she becomes a china doll, and when she experiences one final “growth spurt” as she goes between eating tarts and drinking ink, she is an effigy of herself with the child trapped inside. Complementing the bizarre events is a cacophony of jarring noises combined with moments of surreal silence. There is very little actual dialogue in the film, and in fact all lines that exist are spoken through Alice via a close-up shot of her lips a la The Rocky Horror Picture Show. This conscious use of sound penetrates the senses and is used masterfully in combination with the images onscreen. Indeed, by the time the movie ends, it is uncertain whether she is even asleep and dreaming. After all, the White Rabbit is still missing from its display case, and either way, Alice has obviously been profoundly affected by her experience. The end result is an incredibly outlandish and ultimately unsettling movie experience that really isn’t for everyone. Honestly, despite the fact that I appreciate the film on its artistic merits and thematic studies, it’s not for me, either. Just as I admire the literary works of Postmodernists like Thomas Pynchon and David Foster Wallace even as they leave me a little cold, Neco z Alenky is a fascinating work by a brilliant individual that fails to affect me on a very personal level. Still, credit goes to Svankmajer for his extraordinary imagination and ability to make a film so worthy of analysis, so much so that I do hope to explore some of his other works at some point in the future.